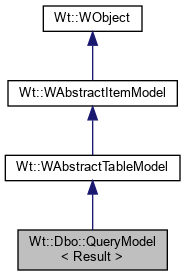 The header is used as Wt::DisplayRole for the column header data. For the column items, flags() will returned the given flags. For example, to indicate that a field is editable, you can set the Wt::ItemIsEditable flag. Returns data of type Wt::DisplayRole or Wt::EditRole based on the field value corresponding to the index. If necessary, this fetches a batch of results from the underlying database. For items in column column, flags() will returned the given flags. For example, to indicate that a field is editable, you can set the Wt::ItemIsEditable flag. If role = Wt::EditRole, sets the value for the field corresponding to the index. All other editing is ignored. The model will return this data in headerData(). Only column headers are supported (orientation == Wt::Horizontal).